Sunday Mornings around here are usually a slower pace, or we try to make them that way after the CRAZY busy year that we’ve had. We always sit down to breakfast together and one of our favorite additions to breakfast is the potato pancake. Easy, buttery goodness! 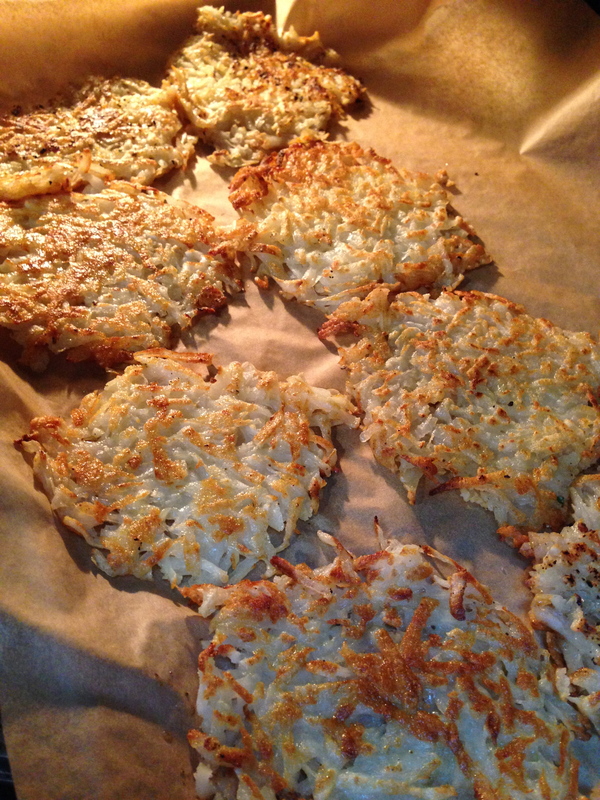 Not from a box or a mix it takes minutes to make and is a great sunday morning comfort food. Put a large skillet on medium and add a tablespoon of butter. 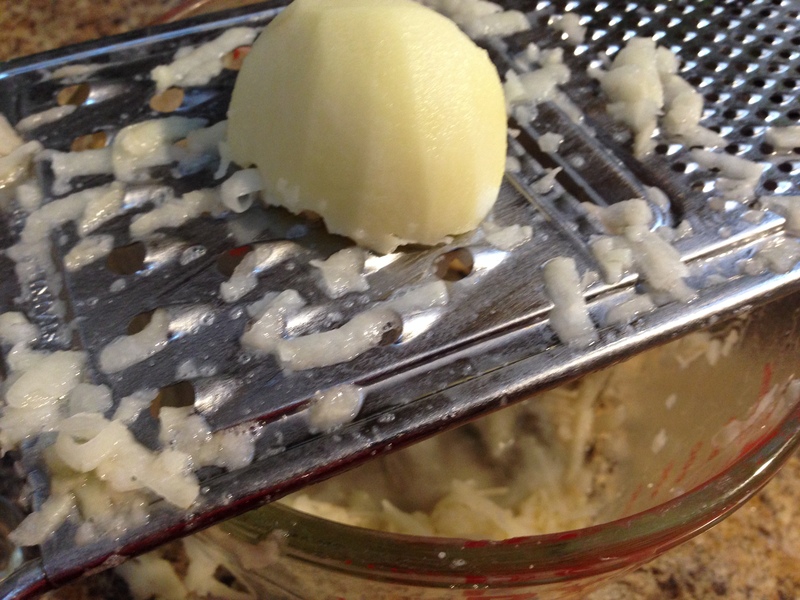 Shred the potatoes 2 at a time into a bowl. 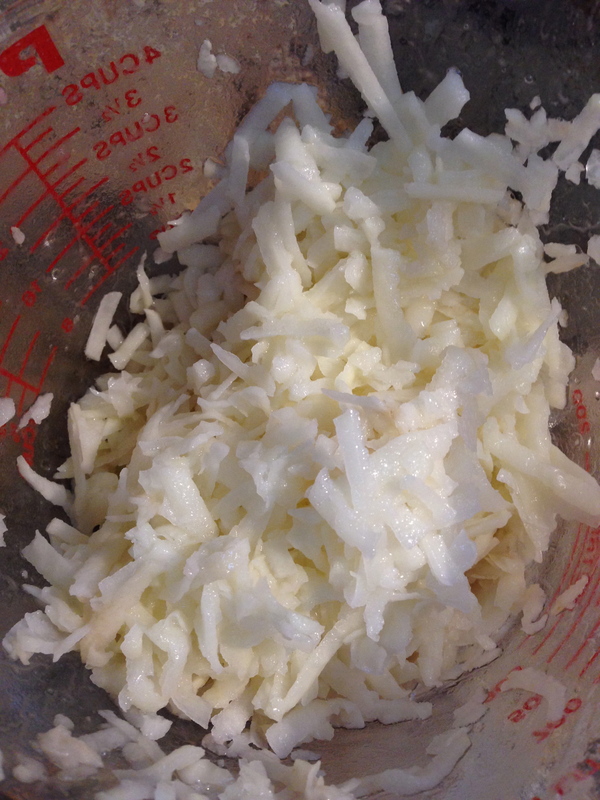 Once the skillet is warm and the butter melted, grab about 1/3 cup of potato shreds and put it into the skillet. Flatten with your hand. Repeat until the skillet is full or until you need to shred more. Sprinkle with salt, pepper and onion powder. Cook until nicely browned, flip and cook until browned again. You can hold these in a 200 degree oven until you are ready to serve them. Voila! Easy-peasy potato pancakes! No fillers, no crap… Just delish! Make extra and freeze ’em! The freeze great and reheat in an oven or in a skillet super quick!! These would be a great side to any meal as well, not just breakfast! You can add rosemary and roasted garlic or jalapeño and cheese…the combinations are endless! 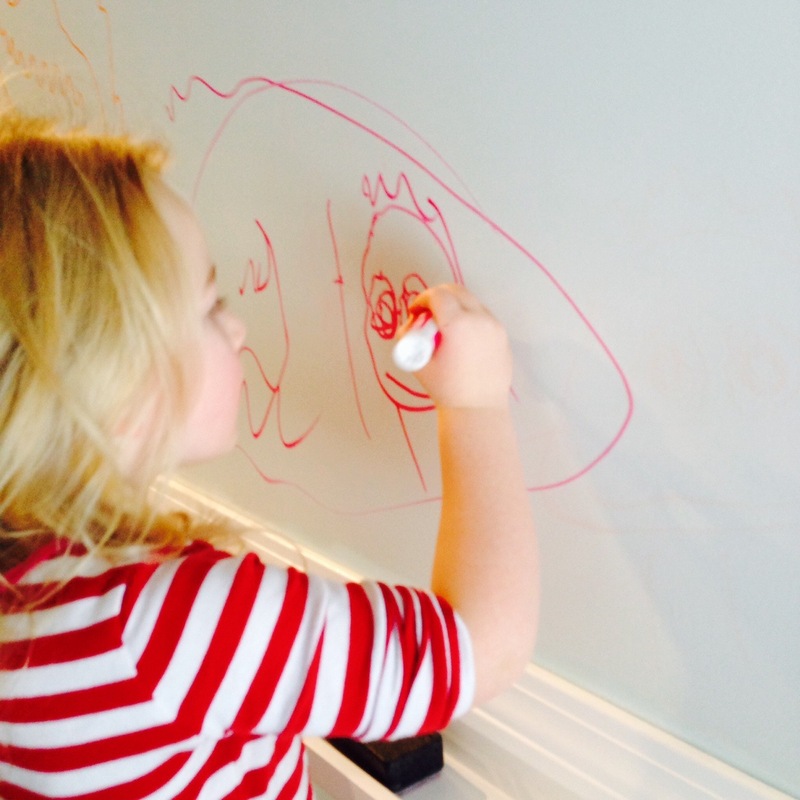 A simple moment in a usually crazy week that helps to remind me what these special days are all about. If you’d like to do the same, leave a link to your ‘moment’ in the comments for all to find and see what everyone else is up to. 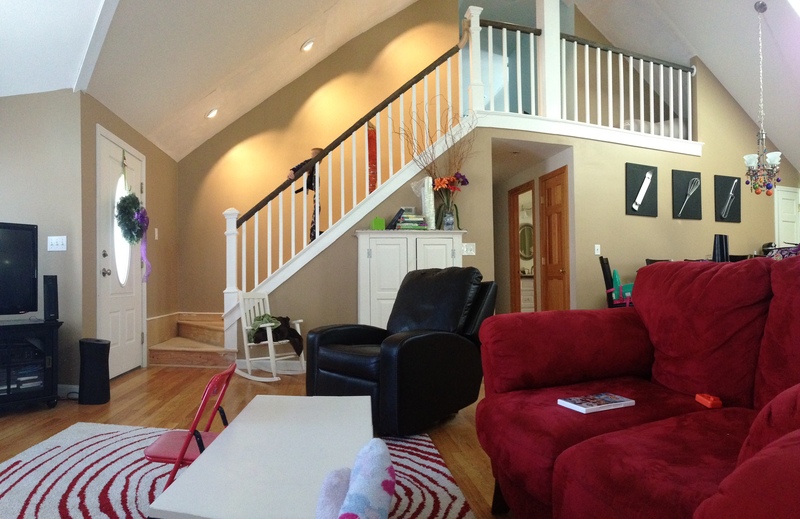 Posted in HomeSchooling, Homestead, Uncategorized	Tagged Kids, Maine, two word moment. Bone Broth aka Stock… So good for you! Quite a bit has been said lately about bone broth ( I call it stock) and it’s health benefits from keeping the immune system healthy to remineralizing teeth!! I make stock at least once a week. Usually from chicken, but sometime from beef. Stock is an amazing way to use up veggies and bones from other meals like roasted chicken or beef short ribs. If I am pressed for time (who isn’t), I usually throw the ingredients in a crock pot on low before bedtime and strain it in the morning. The recipe below is for a stove top simmer, but if you are pressed for time or want a great meal when you get home from work, just throw it into a crock pot in the AM and set it to high. When you get home, strain it and add some veggies, beans, rice, tomato paste…so many options! Please us organic ingredients if at all possible. Sometime I use whatever I have on hand to make a stock. Leeks, red onions…whatever herbs I have around as well. The Recipe below is a standard recipe to follow. Place chicken, vegetables, and herbs and spices in 12-quart stockpot. Cook on high heat until you begin to see bubbles break through the surface of the liquid. Turn heat down to medium low so that stock maintains low, gentle simmer. Add hot water as needed to keep bones and vegetables submerged. After about 2 hours, remove the chicken, pick off all of the meat and return the bones to the stock for additional simmering. Allow the meat to cool and use in the finished soup, shred and season for chicken burritos, chop chilled chicken and mix with mayo, lemon juice and thyme for chicken salad….so many options!! 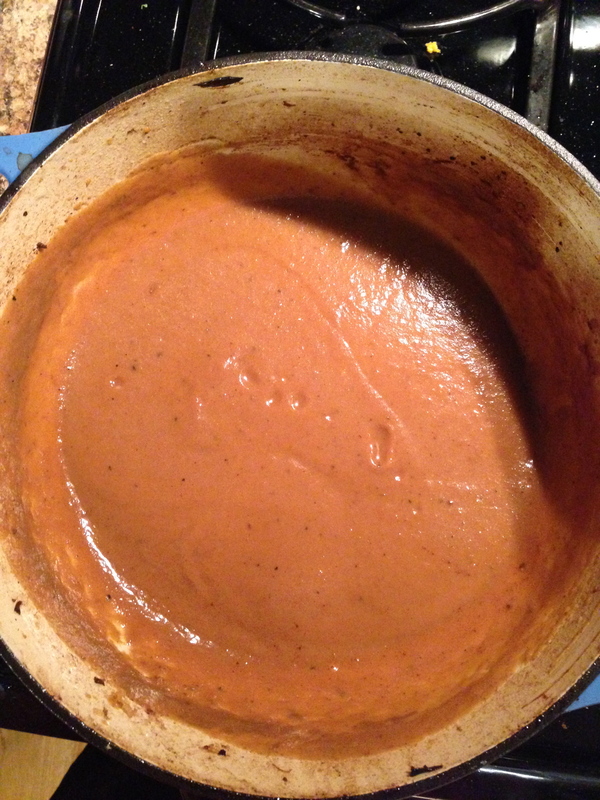 Back to the stock…Simmer uncovered for 6 to 8 hours. Strain stock through a fine mesh strainer into another large stockpot or heatproof container discarding the solids (or eating them as a warm snack..yum!!). You can finish the stock by making into any stock based soup of your choice or cool immediately in a sink full of ice water to below 40 degrees. Place in refrigerator overnight. Remove solidified fat from surface of liquid (you can keep the fat to sauté in or freeze it for use in roux) and store in container with lid in refrigerator for 2 to 3 days or in freezer for up to 3 months. Use as a base for soups and sauces. So….I’ve embarked on this gluten-free journey and so far so good! I have been so tired with a general feeling of crapiness for such a long time now, that I figured it was time to try something different. Years ago, when the low carb craze hit, I did it and felt great (of course, I was a lot less fluffy then *wink, wink*)…but I remember feeling great. We eat great quality foods. We eat organic foods with no preservatives or GMO. We eat lots of fresh produce and meats that we raise ourselves (organically) or that we buy from friends who also grown organically. We cook almost all of our meals at home, so we know what goes into them. We don’t use chemicals in our home and use homeopathy as a means of getting ourselves well and food based remedies as well. 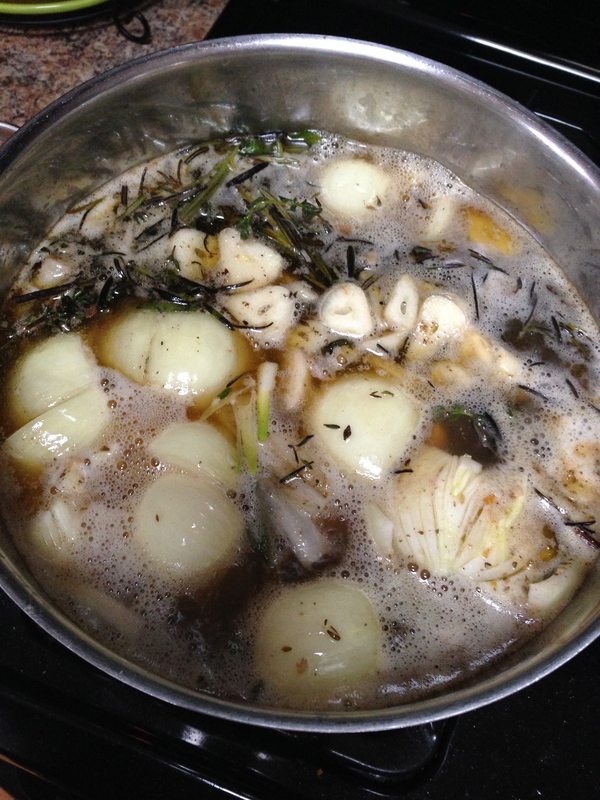 We eat raw garlic and I make a bone broth (stock) at least once a week. Why in the world am I so tired and icky?? I’ve been feeling that wheat/gluten is the culprit for a while but haven’t made the jump until now. You see….I LOVE bread! It is what I eat when I don’t feel good, it is what I eat when I do feel good, some form of flour is always being eaten here at home as a meal or with a meal. I thought that the transition would be harder, but honestly, it hasn’t been!! I feel better, have more energy (I’m not ready to run a marathon yet…) and am not craving the bread like I thought I would. Yay! Sooo…as I embark on this journey I will create new recipes, I will try new recipes and let you know how they turn out! 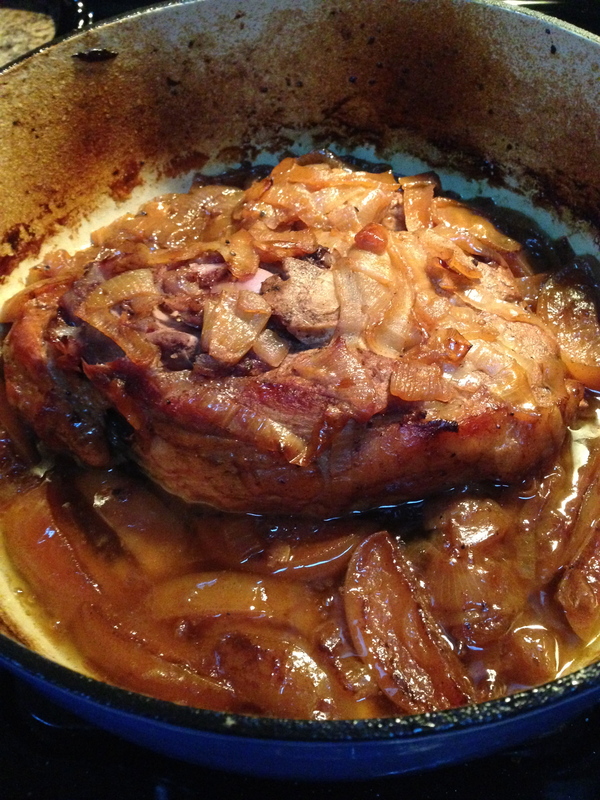 My first official GF recipe is a Roasted Apple and Onion Pork Shoulder. You could easily use a pork roast or tenderloin too! 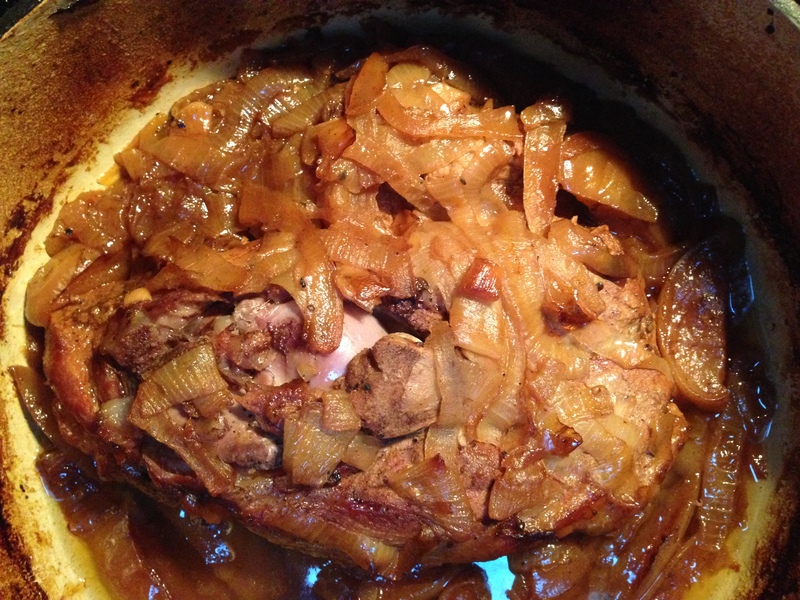 Put about a TBL of bacon fat into the Dutch oven on the stove on a med-high heat and sauté the onions and garlic. 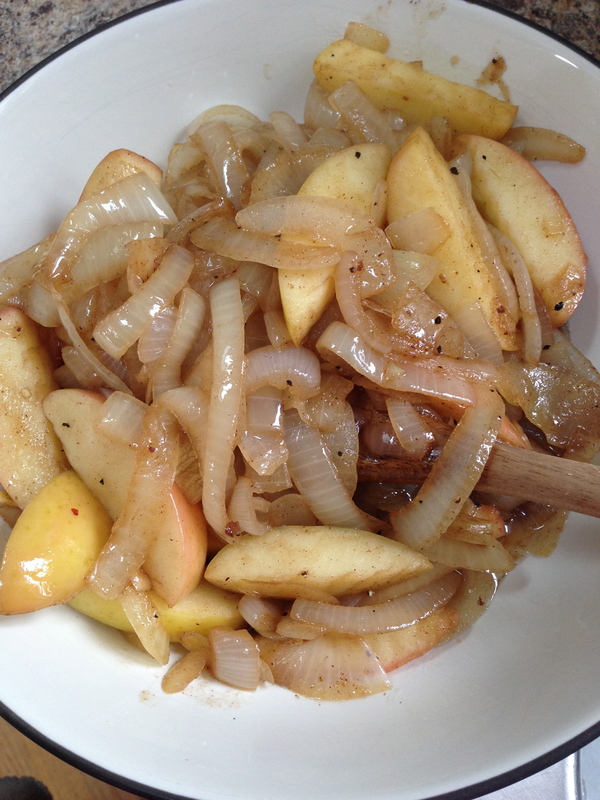 Once they are beginning to brown, add the apples, cinnamon and the balsamic vinegar. Cook for a few more minutes then remove from the pan. Add about a TBL of bacon fat to the pan. Generously salt and pepper all sides of the pork shoulder. 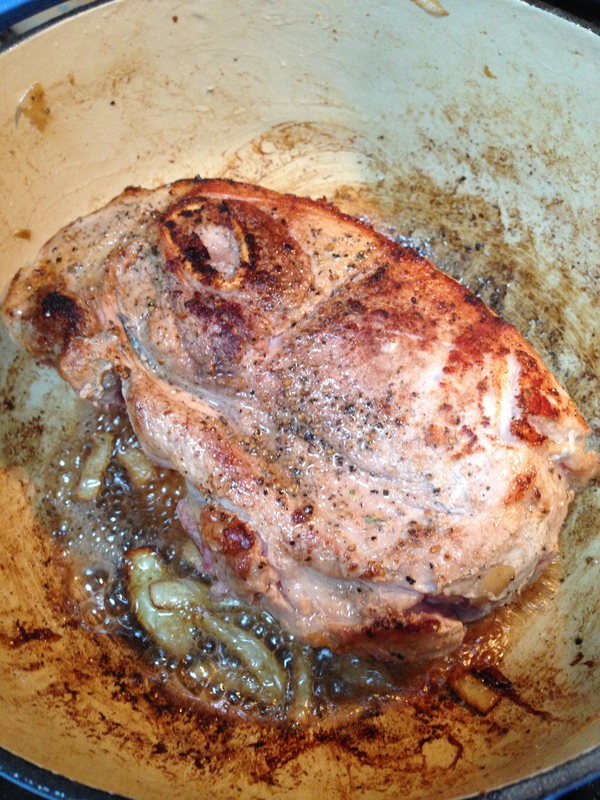 Sear all sides of the pork to create a beautiful brown crust. Once all sides are browned, add the chicken stock (should come about 1/2 way up the pork) and scrape the sides of the pan with a wooden spoon to get all of the yummy splatters into the sauce. 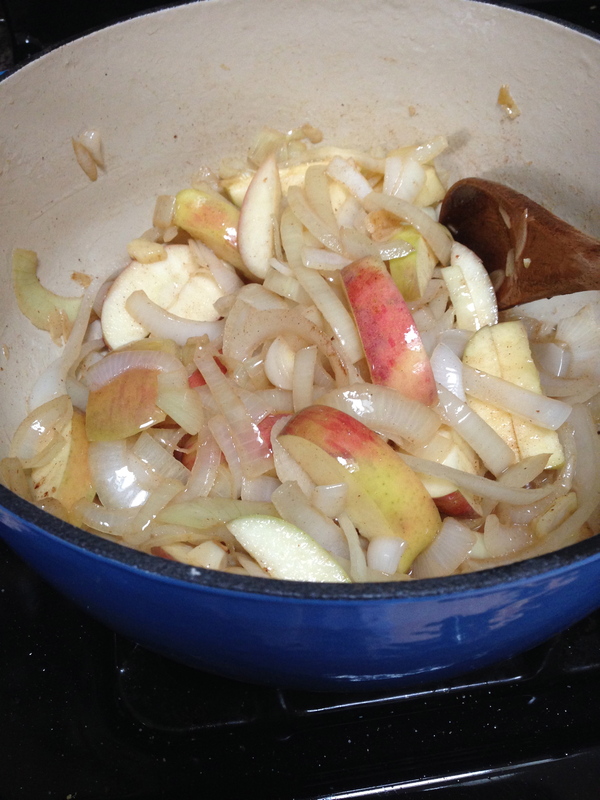 Add the onions, garlic, apples and maple syrup to the pot. 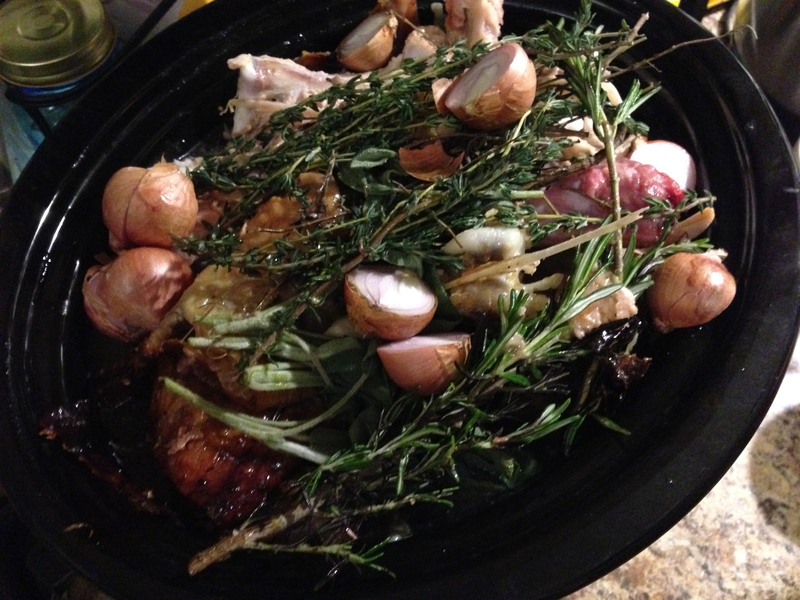 Cover and place in the oven for 2.5- 3 hours or until the roast is easily pulled apart with a fork. Crock pot Option: I would assume that you could throw all of this into a crock pot, put it on low, go to work and return to an amazing dinner too!! Although I did not get any pictures of it, I served this with organic carrot sticks roasted in olive oil, salt and pepper and with roasted organic acorn squash. Roast for at least an hour at 350 degrees or until very tender. Spoon the juices from the middle of the squash over the squash and scoop out onto the plates. The kids LOVED this entire meal…I thought the Hubs was going to dive into the pan, he was nuts over it. I’m glad that I wrote it down! Here we are…A New Year! 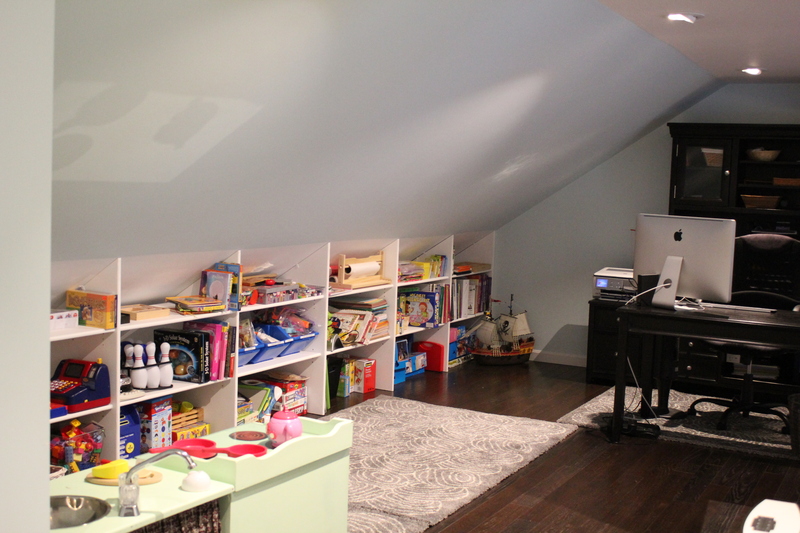 We’ve finally finished (well, mostly) our new school/play/office and added a bathroom. 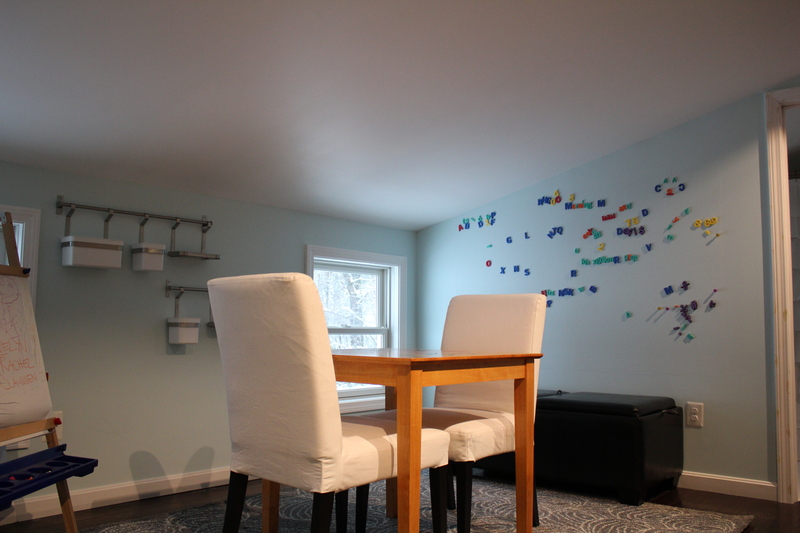 It was a ton more work than we thought it would be, I blame HGTV for that. 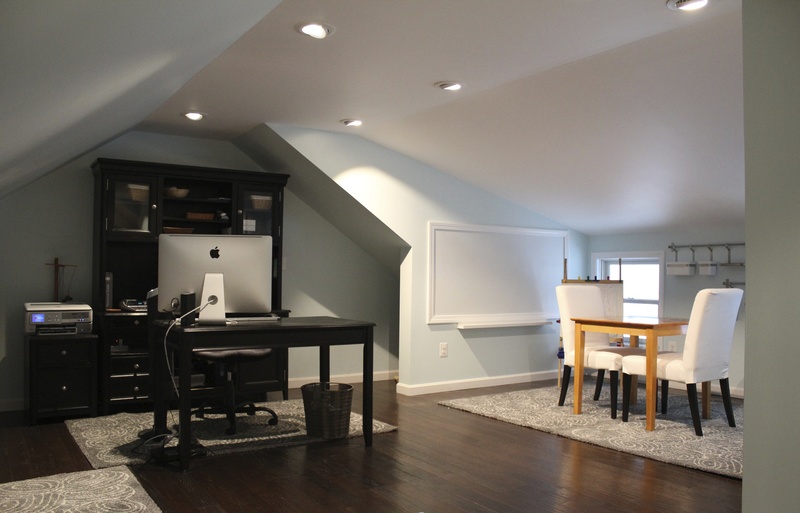 They can redo and entire house in an hour…why can’t we put an addition on our house in 3 weeks…seemed like a no brainer to us! 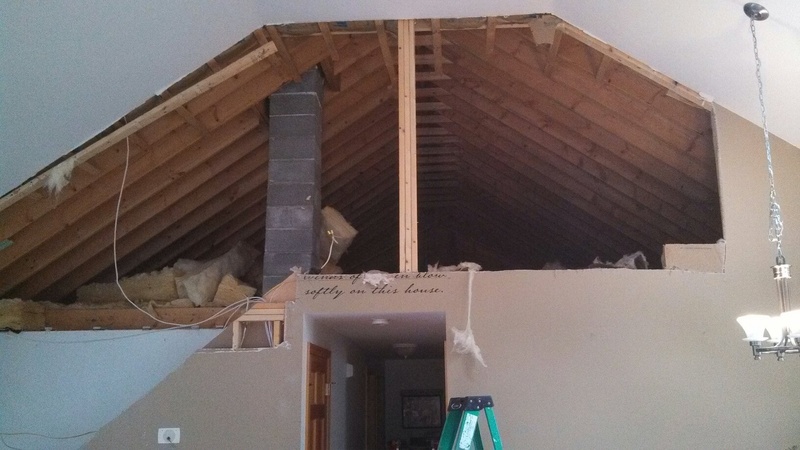 As we found it, it doesn’t work that way and I thank the contractor that raised the roof, so to speak, for not laughing out loud in our faces for even suggesting it. His portion was done in 2 weeks which left us to do sub-floors, wiring, framing, bathroom, floors, insulation, sheet rocking, taping, sanding, mudding…blah, blah in a week. Well, lets just say that 6 months later we are just finishing up. We had some family help along the way. My father in law was with us for a 2 week stint that turned into 5 weeks. 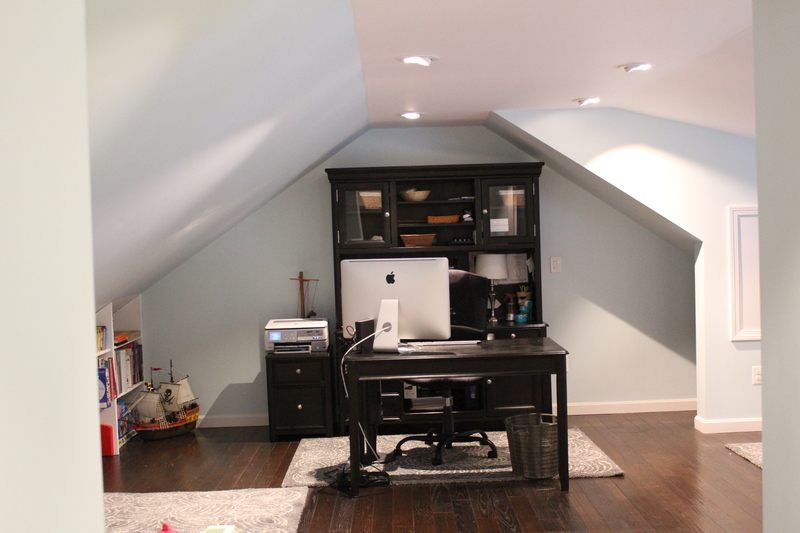 I do believe that him being here saved our marriage from ruin as the Hubs and I don’t do projects together very well, or we didn’t until this rather large project came to be. His knowledge was invaluable and I learned so much! So here we are! The best part of all of this, was that it all happened so fast that there wasn’t much time to think “what the hell are we doing, we don’t know how to do that!”. I watched a lot of you tube to learn and the rest we figured out.